Two Indie Linux Games, Atom Zombie Smasher and Snapshot have made in the PAX 10 list this year and will be featured at the PAX Prime from August 26-28 in Washington. 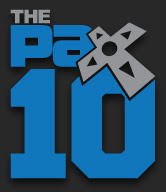 The PAX 10 is a showcase of independent games to be exhibited at the event. This is great news and it is nice to see Indie Linux games getting attention. The developers of these games will get free booth space and will be able to show their stuff to thousands of gamers. Congratulations and good luck to the developers! !